Check the State of Decay 2 system requirements. Can I Run it? Test your specs and rate your gaming PC. System requirements Lab runs millions of PC requirements tests on over 6,000 games a month. State of Decay 2 is about YOUR zombie apocalypse, including up to three of your friends. How will you survive? It will be a four part series on the human survivors inside the game! 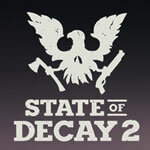 Just like the original State of Decay, you play as more than one individual.